The Office of Transformative Learning works through and with talented faculty, administrators, students and staff to ensure that every student has opportunities for life-changing experiences inside and outside of the classroom. 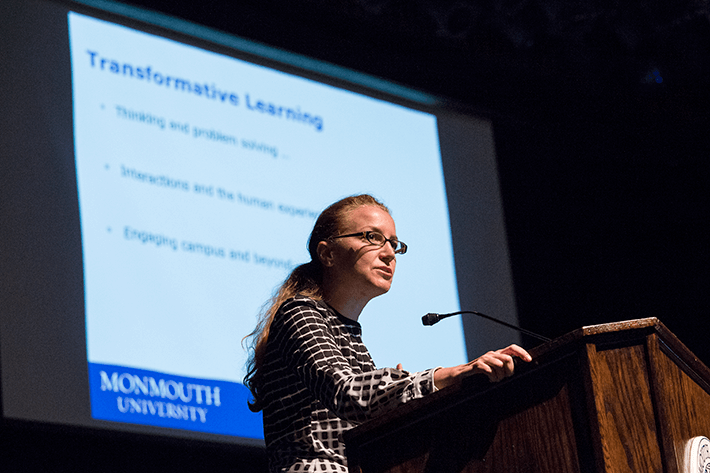 Transformative learning means that students are encouraged to take risks and get outside of their comfort zones to think critically and problem solve, gain exposure to people different than themselves and have a better understanding of the human experiences, and to engage the Monmouth community as such practices hold the promise of active citizenship in their lives after Monmouth. Our team provides academic support to students and opportunities for student leadership in academic areas. We support faculty with professional development and other activities to inspire a strong community of faculty scholars. We provide programming to foster academic success for all students at Monmouth University. The Office of Transformative Learning is comprised of the Center for Student Success—with support ranging in first year advising to writing/supplemental instruction/tutoring, career services, disability services, and transfer students. Other units include the Honors School, the Educational Opportunity Fund, the Center for Excellence in Teaching and Learning, and special advisors for athletics, student transition, and general education.